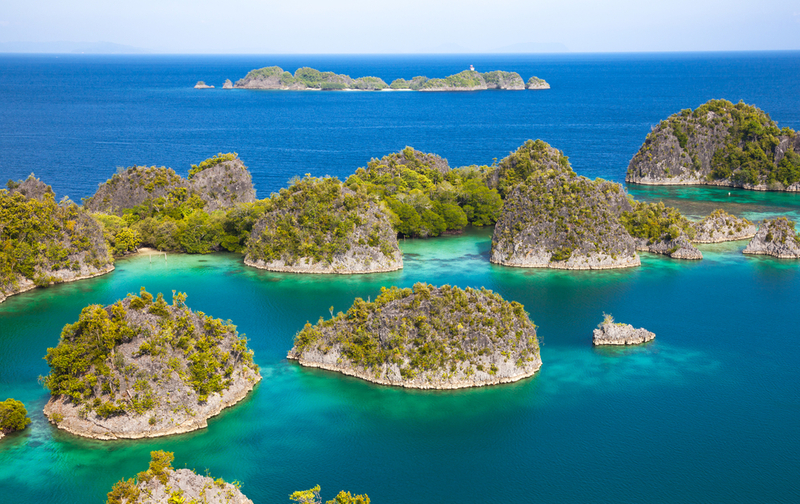 The Raja Ampat region in West Papua Indonesia is a pristine wilderness of 1500 jungle-covered islands and limestone karsts rising out of a translucent blue-green sea. These tropical islands are edged by dazzling white sands and turquoise lagoons, and waterfall pools lie deep in the rainforest. Under the surface, things are just as spectacular. 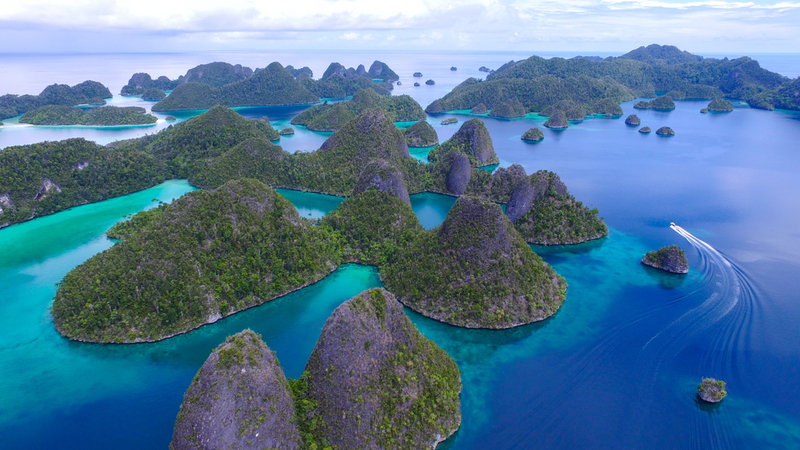 Located at the intersection of the Indian and Pacific Oceans, Raja Ampat’s vast coral reefs host the world’s largest gathering of marine life, making it one of the world’s ultimate diving destinations for yacht charters. Dive with manta rays and whale sharks, see turtles floating by the yacht, and sink below the surface in a whirling maelstrom of schooling fish. Here’s an example of an 8-day charter itinerary for an Indian Ocean yacht charter in Raja Ampat. Your Indian Ocean yacht charter begins in Sorong, where the yacht’s Captain will meet you at the airport and whisk you off to the yacht at anchor. After enjoying a tour of the yacht and settling into your palatial stateroom, you’ll make your way to the dining table on deck for an elegant, breezy lunch as the Captain gets underway for Batanta Island. Batanta’s lush scenery is straight out a National Geographic photo-shoot. Pristine rainforest runs down to flawless white sand beaches, and waterfalls and jungle pools lie behind the coconut palms. Batanta is your first opportunity to look for Wilson’s Bird of Paradise, while offshore, vast seagrass meadows are home to shy dugongs. You’ll finish the day dining at anchor, surrounded by moonlit sea. In the Fam islands, limestone outcrops loom over the water, and cliffs fall away into blue-green lagoons. Under the surface, the world becomes technicolour. The Fam Islands have some of the most magnificent coral gardens on earth. See Wobbegong sharks and Pigmy seahorses at Melissa’s Garden, and 3m Gorgonian fans at Penemu Wall. 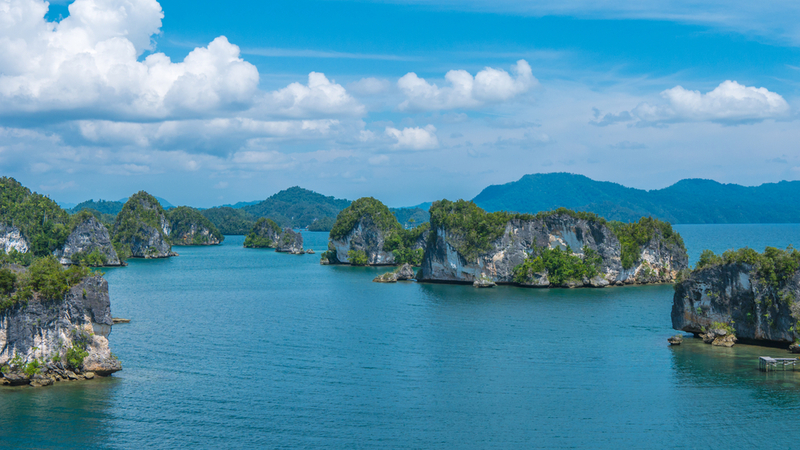 And for one of the most unusual dives you’ll ever do, swim through the rock opening from the sea into the inland lagoon at Batu Rufus, where a giant emerald green lagoon is ringed by rainforest. There are also beautiful white sand beaches framed by boulders throughout the archipelago, perfect for a luxury beach picnic set up by the crew. Right on the equator, Kawe Island offers some of the most spectacular diving of the region, with so many fish that it’s sometimes hard to see where you’re going! Under the surface at Chango, you’ll see giant balls of schooling sweetlips, barracudas and big eye jacks, along with reef sharks and the gloriously odd Wobbegong sharks. At Eagle Rock you’ll find a manta ray cleaning station, as they all swoop in from the blue to feed in the channel. There’s also a fantastic boulder field where Wobbegong sharks hide, while at the Black Rock dive site you’ll see vast expanses of black coral and more fish than you could ever believe possible. Diving may be the main event here on Kawe, but the island also offers stunning white sand beaches and a beautiful waterfall. Today is the day you’ve been dreaming of, as you start to cruise through the famous ‘maze’ of the Wayag Islands. Emerald green islands of spectacular beauty are scattered like jewels through a sapphire sea. The Captain will find you a deserted cove to anchor in before unleashing the watertoys – whether you’d prefer to trace giant circles around the yacht on the jetskis or take the kayak out for a peaceful paddle around some of the most beautiful islands on earth. The best views of the archipelago are from up high, so climb to one of the peaks to look down on this magical place, before heading back down to the sea where the crew welcome you with cocktails and a barbeque on the beach. An unforgettable day on board your Indian Ocean yacht charter. Wofoh Island is actually three islands, linked by pristine coral reef in shallow waters. Dense coconut groves shade perfect white sand beaches, and a lazy day is spent at anchor, swimming off the back of the yacht, wakeboarding in the deeper waters, and snorkelling into the beach to lie on the sands. The diving here on Wofoh is superb, with an excellent reef wall on the west side home to colourful hard and soft corals, barrel sponges, nudibranchs and unicorn fish. Drinks on the sundeck will never be forgotten as you watch the sun set into the Indian Ocean. In a region where great dives meet you every time you dip your head under the water, Kri still stands out as one of the finest dive destinations in Raja Ampat. Cape Kri holds the world record for the most fish species recorded in a single dive, a staggering 374! Currents rush through a gap between Kri Island and Koh Island, creating an underwater wonderland of corals, sharks and fish. Sardine Reef may be even better, with swarming fusiliers, batfish, Spanish mackerel, reef sharks, and bumphead parrotfish just a tiny fraction of the things you’ll see! The best time to dive here is at either dawn or dusk, and when you’ve done for the day you can enjoy a lantern-lit beach barbeque on a nearby sandbar, the chef grilling up fresh fish and lobster on the coals. You’ll start the morning with an early hike into the jungle to look for the famous bird of paradise, before heading to the incredible Passage for a dive you’ll never forget. The Passage is a deep canyon between two islands, creating a narrow ‘river’ lined by cliffs and rainforest. Seawater rushes through it, bringing plenty of marine life, with lobsters and schools of yellow barracuda, as well as the adorable Pigmy seahorses. Diving the passage you are surrounded by coral, but look up through the water and you can see the trees of the jungle looming overhead. 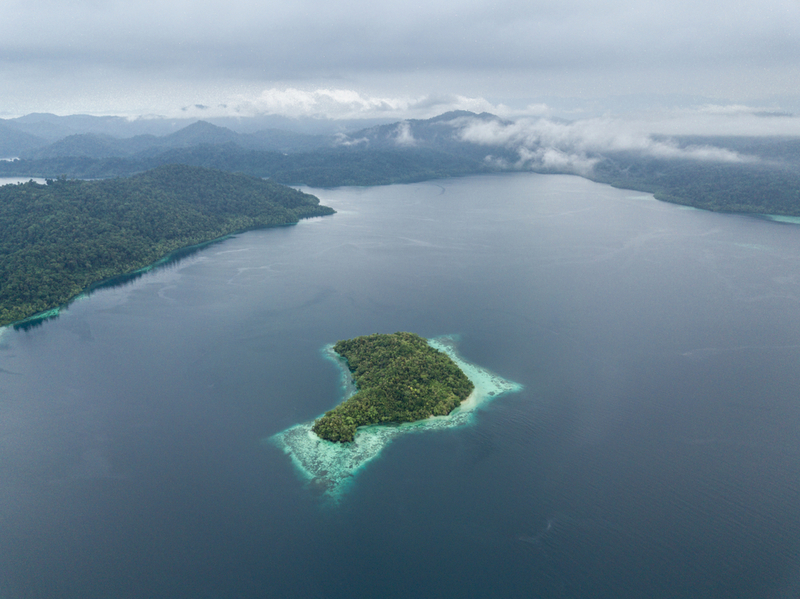 Corals and cliffs and rainforest—all on one magical dive! Those who don’t want to dive will enjoy a kayak or tender ride through the passage, marvelling at the scenery above and below and listening to the birds call from the jungle. Another day on charter in the Indian Ocean, another day of heaven. You’ll wake up in Matan Island, where the yacht has cruised to overnight. This is your opportunity for a last swim off the yacht and a leisurely breakfast on deck as the yacht cruises back to Sorong where you will depart. As your plane lifts up into the skies, you’ll look down upon the stunning limestone and jungle islands you just floated through ton your epic Indian Ocean yacht charter.